The second film directed by 28 Days Later, Sunshine and Never Let Me Go screenwriter Alex Garland, who made his directorial debut with the provocative and intellectually stimulating Ex Machina in 2015, Annihilation is another unique work of science fiction that challenges us with its heady themes and ever shifting tone. At the beginning of Annihilation, Lena (Natalie Portman) is an ex-soldier who is working as a biology professor, teaching a class about gene mutations. We find out that her husband Kane (Oscar Isaac) is also a soldier, who has been missing for a year, and she is trying to reconcile herself to the fact that he might have been killed in action. But things take a strange turn when Kane mysteriously shows up in her bedroom, not really seeming like himself. When Kane goes into shock and falls violently ill, he is taken to a secure government facility and put into quarantine, where Lena finds out that he was investigating a mysterious environmental phenomenon dubbed the Shimmer, a glistening wall of sorts that appeared suddenly three years prior and has separated off a section of the Florida coastline, and is continuing to swallow up an increasing amount of the area surrounding a lighthouse. The researchers have no idea where this thing came from, it could be extraterrestrial or a portal to another dimension, but everyone who goes in seems to lose their minds, and they have little hope of getting out alive. Desperate to find out what went wrong with her husband, Lena volunteers to go into the Shimmer, with a team of four other women including psychologist Dr. Ventress (Jennifer Jason Leigh), paramedic Anya Thorensen (Gina Rodriguez), anthropologist Cass Sheppard (Tuva Novotny) and physicist Josie Radek (Tessa Thompson). What they find is a strange world where no radio signals can get out, time seems to move at a different pace, and flora and fauna are mutating rapidly, leading to unexplained biological anomalies. Based on Jeff VanderMeer’s novel of the same name, the first book in his Southern Reach trilogy, Annihilation is an intriguing work that is hard to pin down in terms of tone. The film maintains simmering suspense throughout, while also exploding with moments of terror, blending introspective sci-fi storytelling with elements of horror. It even delves into monster movie territory at a few points, when they encounter the terrifying hybrid creatures that exist in the Shimmer. The film could almost be described as like a cross between Arrival and Under the Skin, mixing the character drama and intrigue of first contact in the former, with the deeply strange and quietly unsettling tone of the latter. The film unfolds in flashbacks with Lena having returned from the Shimmer and being questioned by a hazmat suited scientist (Benedict Wong), and even though we know from this narrative structure that she has physically made it out alive, the experience of piecing the story together is no less tense. Natalie Portman does an excellent job of carrying the film on her shoulders, and her performance is a big part of why Annihilation is worth seeing, as she handles both the physical and emotional demands of the role exceptionally well. The film is also unique in the sci-fi genre in that the majority of it revolves around an all-female ensemble cast. The film immerses in the world of the Shimmer through a mix of exceptional production design and impressive visual effects, showing all of the biological phenomena on display, and featuring different fantastical plants and creatures that range from wondrous to flat-out terrifying. The sound design is equally excellent, with the eery use of music and extended periods of quiet that are interrupted by loud sounds helping the film burrow deep under our skin. The ending has the power to shock through some truly freaky imagery, even mixing in elements of pure psychedelia. 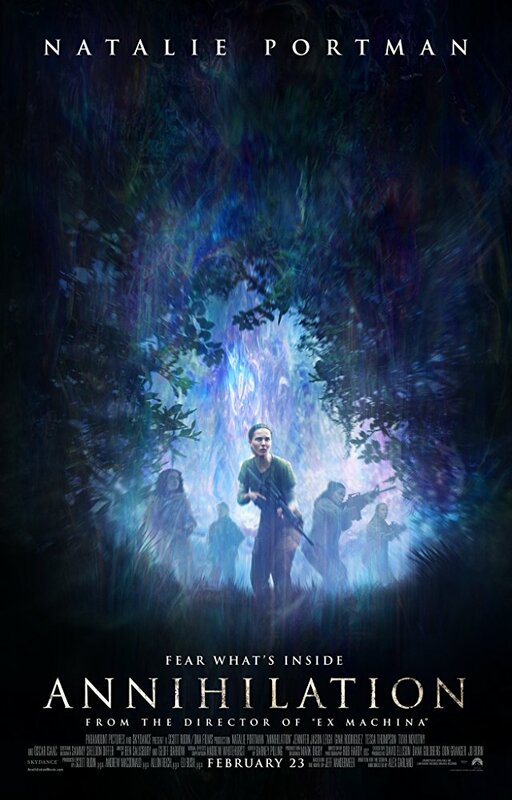 Like Alex Garland’s other works, Annihilation is a film that is unafraid of challenging viewers, even at risk of alienating them or leaving them cold, but it’s a work that is all the richer for it, almost guaranteed to provoke discussion and debate. The film is much more impressionistic and artistically daring than a majority of big studio films, and as such it is almost guaranteed to prove extremely divisive with regular audiences. The story is rich with deep themes about the never-ending cycle between life and death, and can also be read as a metaphor of the real life effects of PTSD on a relationship, with someone physically returning from war, but seeming alien to their spouse. Like a shell or copy of their former self. This is the sort of film that not enough major studios put out anymore. While Paramount is taking a chance on releasing it theatrically in the United States and Canada, it’s telling but no less unfortunate that it will only be released on Netflix in foreign markets. This is an interesting film, both visually and thematically, and one that kept me intrigued to see where it would take us next. See it on the big screen if you can to get the full experience.